Pt. Betsie is just a few miles north of Frankfort. 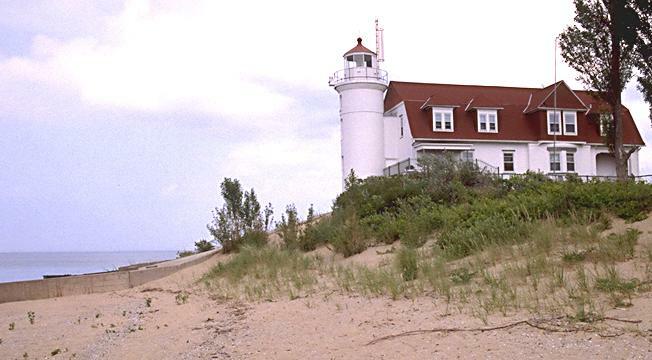 It's an active Coast Guard facility, with the keeper's house occupied, although the light is now automated. Access to the grounds is restricted, but the surrounding beach is available for clamoring. 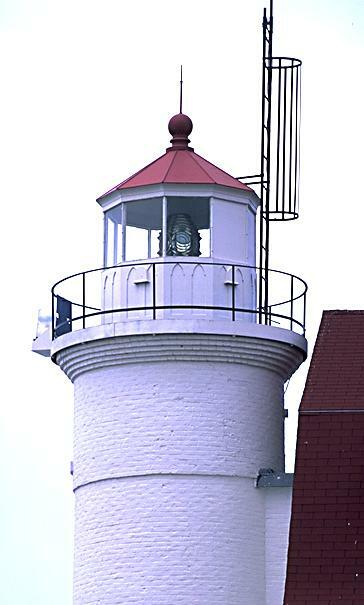 The light was built in 1858, and it retains a beautiful rotating Fourth Order Fresnel with a bull's-eye lens arrangement. Sitting 52 feet above the lake, this lens has an incredible range of 27.5 miles. Pt. Betsie was manned for 106 years, but in 1983 finally succumbed to automation. The keeper's house has been converted to apartments for Coast Guard Personnel. The beach must take an unusually harsh pounding from Lake Michigan storms, because there has been much shoring up with concrete and steel breakwaters and aprons. Pt. Betsie is easily reached on Pt. Betsie Rd. off M-22.